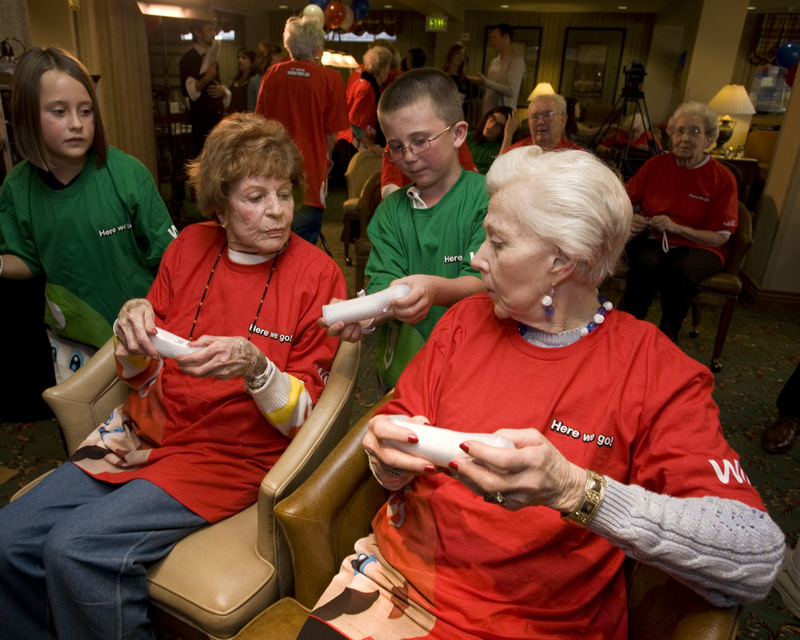 Wii For Old Folks? You mean my excuse doesn’t work anymore? For quite some time now, I’ve been blaming my total lack of video-gaming ability on my age. I am so bad at Wii that according to my Wii Fit, I should be stumbling all over the place, barely able to walk and talk on my cell phone at the same time. But I don’t really care what the Wii Fit says, because I just tell myself (and all of you), I’m past forty! It’s chronologically impossible for me to learn this stuff. So what if my son has shown me 47 times how to play The Legend of Starfy, and I still can’t get past level one? So what if I get trapped in the same damn room in Fossil Fighters every time I try. Or if Super Mario Brothers for me will forever be Mario, Renzo, and Bob, the tennis counselors at my camp? Age, for once, is on my side. I am not of the generation to master vidoe games of any kind. Put that in your remote and click it. And then I heard this: baby boomers and seniors are playing video games. A lot. Believe it or not, more than 25 percent of all video game players are 55+ per www.theesa.com. And not just older people…but OLD people. See that picture? That was taken at a senior centers where Nintendo, as part of a month-long program, brought video games for seniors (and their grandkids) to play. Did these people use their age as an excuse? You can bet they did. But then, guess what? They started loving it. They’re playing, they’re starting Wii Bowling Leagues. They’re good at it. Which is all fine and dandy for them, but what does it say about ME? I cannot hula Wii style, or ski jump, or balance those little friggin balls on the 3D platform. And apparently, it’s not my age, it’s ME! These old people may be getting exercise, being social, connecting with their grandkids but me, I’m just a spaz. Full Disclosure: While I have received goods from Nintendo in the past, no goods, services or pay was received in conjunction with this post. I Wii Bowl and do yoga… because I can be really bad at it but no one is there to laugh at me (as long as I do it while the kids are in school). Wii Fit has that nice lady voice that is so encouraging when she says I still haven’t lost any weight and my center of gravity is so far left that I should just roll across the room instead of walking- how can I not do what she wants, even if it means that I look like a pretzel in need of chiropractic care when she is finished with me? Just ignore the fit board so you won’t fall off- you don’t have to use it I found out after I fell,er,misjudged it’s placement.